Maki - Ingredients wrapped in Nori(Seaweed). Four types of Maki. Inari - Fried Tofu act as a container that holds the ingredients. Narezushi - Fermented fish used as main ingredient. Nigiri - Ingredients pressed into shape by sushi chef. Oshizushi - Sushi is molded by a box. Chirashizushi - Bowl of rice with many types of ingredients, also called scattered sushi. Note * Raw fish or meat sliced and served without using rice is called sashimi. Read more on the difference between Sushi and Sashimi. 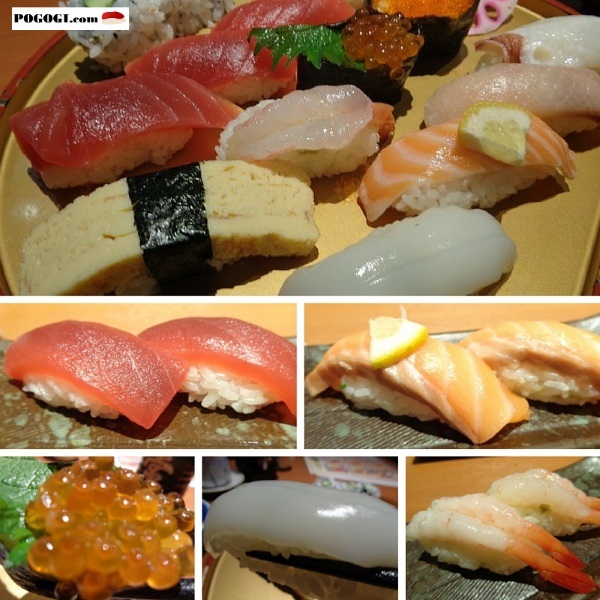 The most popular type in Japan is Nigiri where as in Western Countries it is the Maki Rolls. You can read more about the differences between the two by clicking on the image below. The increasing popularity of sushi outside of Japan has resulted in other ingredients such as avocado, cucumber, okara, fake crab meat(pollock), fruits and other varieties of meats and sauces. Probably one of the most famous roll outside of Japan. Main ingredient is Crab Meat where most restaurants will use imitation crab meat pollock. Yellowtail Amberjack is eaten either cooked or raw. This type of Yellowtail is a boney fish that is considered a luxury fish in Japan and has been farmed extensively(less expensive). Characterized by intricate layers of thinly sliced avocado pieces placed on top of the roll, making it resemble the back of a caterpillar. Read More on Caterpillar Roll. Freshwater Eel. Takes time to prepare; Eel is Filet, then grilled, then steamed then grilled again with a continuous basting of Unagi Sauce(parts of eel, soy sauce, sugar, and sake). Uangi is known to have an abundant amount of health benefits. Also known as the BC Roll, it contains barbecued pacific salmon and cucumber. Also as a substitute, barbecued salmon skin with mayo is used. Hidekazu Tojo claimed to have invented it in 1974 in Vancouver. A quite recent addition to Japanese sushi but is very popular in North America. Salmon that is typically used in sushi today is farm raised. Salmon is a popular choice because it has a rich and flavorful taste and it is also very healthy. To get the best taste Read More on Sushi Grade Salmon. Popular on the West Coast of United States and Hawaii, this roll is characterized by red and green hana ebi. A very popular Roll in North America. Its iconic ingredient is Cream Cheese, hence the name Philadelphia Roll because of Philadelphia Cream Cheese. Other main ingredient is raw or smoked salmon. Fatty tuna meat comes from the belly(Toro) of the Tuna. It can be very expensive depending on the color, taste, texture and cut, much like grading steak. Eaten raw, it is rich in omega 3 and very oil that gives it a buttery taste when consumed. This is also called a Tuna Roll in Western Countries but using a more expensive Tuna in Ahi. What is Unagi and How to Make the Basic Sauce (Recipe)? Japanese food enthusiasts who work through the entire sushi menu encounter Unagi at some point.